The Carrboro Century Center has five furnished, accessible meeting rooms and a fully equipped kitchen available for rental. The meeting rooms, or the 4,236-sq. ft. Century Hall can be configured to suit any type of event - including weddings, receptions, business meetings, classes, dances, workshops, birthday parties, baby showers and even reunions! 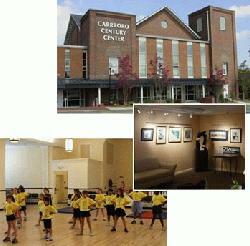 Also housed in the Century Center is The Carrboro Cybrary (Cyber Library) which has five public computer stations (including assistive technology for people with hearing or visual impairments), numerous newspapers, magazines, books, audio books, a copier and a fax machine. Hours of Operation: Monday through Friday 9:00 a.m. to 5:00 p.m. We are open at other times for reservations.